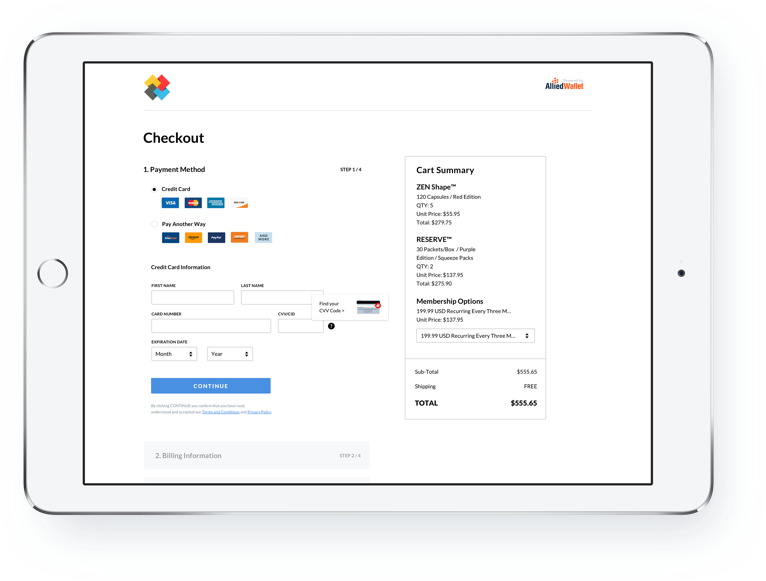 Accepting payments for your online business has never been so simple. Allied Wallet is one of the leading turnkey payment gateway solutions in the industry. With more than a billion dollars processed globally and millions of satisfied customers to our credit, we make sure your payment processing is reliable around the clock. Allied Wallet has powerful tools and resources available that can help companies hit the ground running from day one. Flexible, full-featured credit card processing services are hard to find, but we can customize a solution for every type of customer. We go the extra mile to ensure that all transactions are encrypted and secure using state-of-the-art payment processing technology. Low, Flat-Rate Pricing. No Hidden Costs. With a seamless, hassle-free integration to our payment gateway, you can avoid a long integration processes. We’re a top-rated, award winning payment processor in North America and Europe for our outstanding service. *Base rates vary depending on business type and previous processing history. Allied Wallet offers simple APIs for businesses of all sizes that can be seamlessly integrated with virtually any major E-commerce service in any programming language. Our RESTful APIs offer direct integration or web-hosted payment pages with features like tokenization and simple third-party integrations, creating a more flexible and reliable payment option. Allied Wallet works to create transparent, user friendly code that can easily be added to any site. Copy and paste the above API to see how it works. We accept payment methods from over 100 of the world’s leading alternative payment methods. Going way above the industry average of payment options gives your customers more freedom resulting in better conversion rates and more repeat business. Allied Wallet offers some of the best leading turnkey credit card processing services in the industry. With billions of dollars processed globally and millions of satisfied customers to our credit, you can have complete confidence that your transactions will be safe. Fill out the form below and our sales staff will get back to you immediately to setup your account and get you on your way.